The statistics are astounding. Between the years 2000 and 2040, the population of older adults in the United States will more than double, to the point that one in five people you see on the street will be older than 65. Over half of those older people will be women. Many of those women will be widows. Many will live alone. Many will be fighting poverty while still more will be providing care for another person while also caring for themselves. In the face of these growing numbers, we cannot afford not to think about aging for the sake of our communities and the sake of our friends, neighbors, family members, and colleagues who will be the 79.7 million older Americans in 2040. The numbers tell both a tale of caution and one of opportunity for women, as you will read in this book. The experience of aging for women can be a time of struggle and challenge – both anticipated and unexpected – especially for those who are not prepared to be older. Today we live in a world where no one teaches us how to age, and women are particularly vulnerable as they face a reality of living longer, potentially alone, with limited resources and a shrinking network of support. But aging does not have to be a time of trauma if we continue to talk and think and plan. It does not have to be a time of stigma if we acknowledge that people are aging all around us, and we are aging with them. Knowing what we know, we are at a pivotal moment right now where we can change the experience of aging for women for the better if we are willing to speak up, and loudly, about what it means to be an aging woman. This book from some of the aging field’s most respected thinkers starts the conversation. It has become common knowledge that the demographic of older adults has shifted. The expectation to live longer is a world-wide phenomenon. Globally, older people represent increasing proportions of the population. The importance of this book rests on the fact that older women, age 65 and up, represent the majority of the older adults in the United States. While men still slightly outnumber women world-wide, women represent a greater percentage of older adults. This will remain true as long as women continue to live longer than men. Currently women are expected to outlive their male counterparts by six years. Longevity clearly brings challenges as well as opportunities. This book is about some of the obstacles that women are likely to face and provides examples of professional interventions that might help them to overcome barriers to achieve a desirable quality of life. There is also an emphasis on the strength and resilience that women display in the face of difficult situations. These strengths are exemplified by the willingness of older women to take on complicated roles as they age. For instance, many older women care for their grandchildren as replacement parents. This role may take a toll on the well-being of grandmothers who suffer health problems and financial difficulties as a result of the added stress. However, these grandparents often take on the primary care of grandchildren, usually in times of crisis, offering the children stability and care. The limitation of their legal rights to make parental decisions often complicates the experience. In the first chapter, Coupet and Cryer-Coupet provide an overview of the benefits and burdens of fulfilling this caretaking role. Monahan reminds us in the second chapter that as women age, they are likely to take on caretaking roles. In fact, women make up the greatest number of caregivers worldwide. It is likely that women will provide care for their spouses or other relatives and the trend is likely to increase as men and women live longer despite chronic illnesses. Monahan describes the trends for women providing care as well as policy and practice implications for clinical social workers and other service providers. While caregiving provides a great benefit to care recipients and often to the caregivers, the role is also associated with higher rates of physical and mental health issues, already inherent in economic and health disparities. The challenges of economic disparities between the genders have existed for decades. However, for older women, concerns about poverty and inequitable access to social security benefits based on fewer years in the work force and lack of employment opportunities are but a few of the issues discussed. George, Hilvers and Grossman examine in the third chapter the various pathways that lead to economic distress for older women, including the potential for homelessness. These factors include single-family head status, reduced labor force participation due to care giving, and low wages and benefits from work due to job segregation and discrimination. 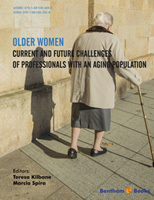 Sokolec continues with the fourth chapter on health disparities among older women. While this is an increasing concern for many within the U.S., it presents a specific challenge to women. Older women are likely to suffer more chronic illness and disability as they age. Many older women live alone without social supports. The discussion of differences between the genders, as well as between older and younger women, highlights some of the difficulties older women face in accessing equitable health care. Access to affordable health insurance is frequently tied to employment and marital status. Since many women are underemployed, preoccupied with caregiving responsibilities or widowed, this puts many older women at a distinct disadvantage. Assumptions are often made about the lives of older women that pose as a disadvantage to their own self-perception. Spira, Sheehan and Primmer, for instance, recognize that the exclusion serves to censor women’s desire to talk about sexuality and increase potential feelings of guilt or shame for having sexual feelings. The expectation that asexuality is normative is challenged in this fifth chapter and replaced with the recognition that continued need for intimacy extends throughout life. Many of these factors combine to increase vulnerabilities and reduce access to needed and effective health services. Orwat, Bessinger and Morgan continue with chapter six on substance use and abuse by women. They depict older women as more vulnerable due to the many disparities articulated in previous chapters. Unique life changes experienced by older women contribute to the difficulty in identification of substance misuse and abuse within this population. Such experiences include loss of loved ones, loneliness, physiological changes, financial stress, pain management, and other co-occurring mental and physical health conditions. Older women are also vulnerable to abuse by others. In chapter seven, Kilbane validates the experience that intimate partners too often continue a pattern of “domestic abuse grown old.” Unfortunately, many cases of abuse are ignored or overlooked. Cases are difficult to substantiate, but perceptions of professionals seem important in the service provided for particular clients. This chapter looks at the how elder abuse investigators and domestic violence workers perceive abuse that has been inflicted upon older abused women clients by an intimate partner. While many problems and challenges of older women are discussed, anecdotal evidence does not necessarily lead to program development or policy change. Research and interpretation of data collected on the various issues is imperative to create change. However, methodological challenges have been encountered in some of the most common forms of data when researching older women. Rucinski discusses the problems encountered in survey research in chapter nine. While the survey is one of the most widely used tools used to plan, set program agendas and evaluate usefulness or satisfaction; recognition is given to some of the potential errors created by cognitive limitations, proxy reports or other concerns. Caution is offered to make accommodations as necessary to maximize quality and balance accuracy. The final three chapters highlight the positive effects of validating the strengths of older women as they age and navigate issues of loss, and decline. Simon and Spira focus on the powerful positive impact that membership in groups has on older women’s sense of well-being in chapter ten. The healing qualities of groups have the potential to mitigate issues of social isolation and loneliness. Women find support, camaraderie and hope through group membership. Dentato, Craig & McInroy remind readers in chapter eleven that the unique experiences of the lesbian community deserve recognition in an exploration of the lives of older women. The women in this community underscore the resilience of aging women, particularly focused on combating discrimination and engaging in activism and advocacy. The final, twelfth chapter of the book reminds readers that older women retain the potential to teach and mentor younger people, even in the face of a progressive illness. Morhardt shares the evaluation of the journals submitted by a young medical student on her experiences of participating in The Buddy Program with a 74 year old woman diagnosed with Alzheimer’s disease. The journals reveal the profound impact of the relationship on helping the medical student recognize the whole person of her mentor, not just symptoms of illness. While present cohorts of women may well continue to suffer from higher rates of disability than their male counterparts, be more likely to live alone, and lack sufficient income and health care supports, more positive self-images and social supports should enable many women to take charge of their lives and improve the quality of their older adult years.